here. / Thank-you. / Remember what I look like. Everything she had thought would be passed on to her child she has discarded as a nicety; now she teaches Tamara about survival. At one point, desperate for antibiotics, she is party to holding up a pharmacist, telling him he is welcome to join them, but they need his medicines and will be taking them from him, whether he is willing or no. In her pre-apocalyptic life, this would have been an unimaginable harshness. thing you have access to? / I wish I could promise T. you were trying. to believe that. / I think we’ve isolated the problems w/the water. 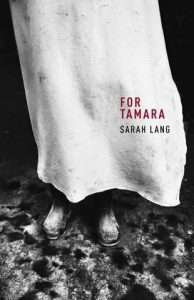 For Tamara is a heartbreaking work, one that is challenging in terms of content. At the same time, the construction of this long poem challenges the readers’ understanding of what a poem can be. Language is fractured. Address is fractured. 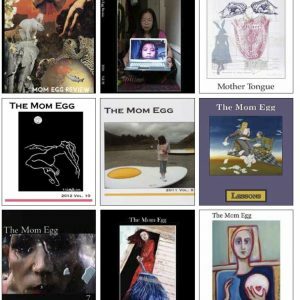 Line-breaks, stanzas, all the niceties of conventional poetry—Lang has written the story of the struggle of rising like a phoenix from the ashes of post-nuclear devastation in a way that echoes and illustrates the tearing down and rebuilding of the rules of life as Tamara’s mother knows it. 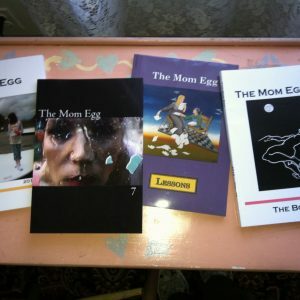 Anne Britting Oleson is a reader, writer and teacher who lives in the mountains of central Maine. Her books include The Church of St. Materiana (poetry, 2007), The Beauty of It (poetry, 2010), The Book of the Mandolin Player (novel, 2016), and Dovecote (novel, forthcoming).